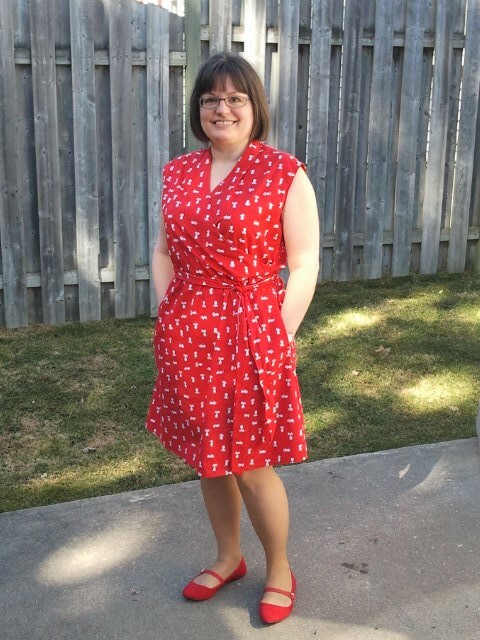 But today’s the day to share this McCalls 7534, which I notice that Margo from Creating the Gap has just made as well, but in rayon and a maxi length. Mine is quite different, as I made it knee length & used quilting cotton. 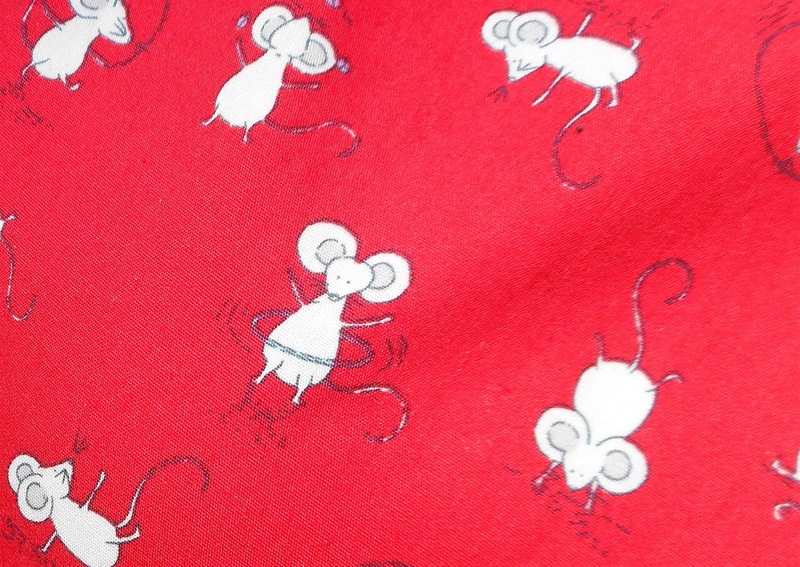 I just had to use this very fun print, a “Groovy Cotton Print – Mouse” that I like to call “the cat’s away”. 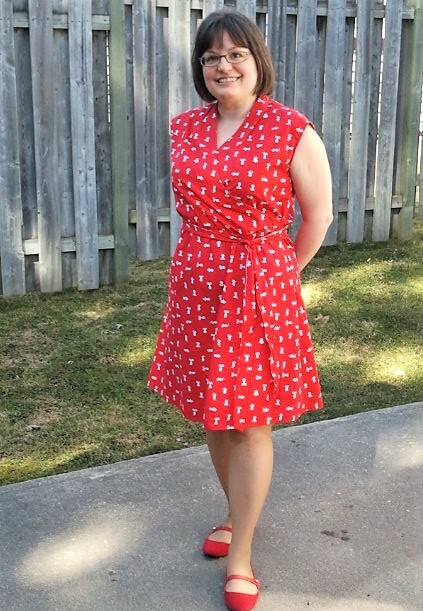 Since the last dress I made for this blog features marching elephants, I have to remember to be careful not to hang this mouse print next to it in the closet unless I want an uproar! 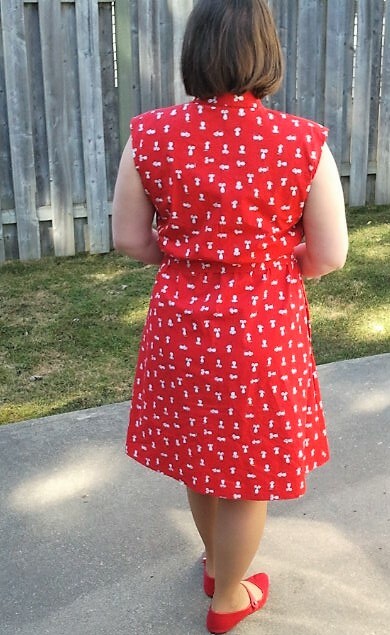 I enjoyed making this easy dress. There are no closures, so it’s suitable for a beginning sewist. 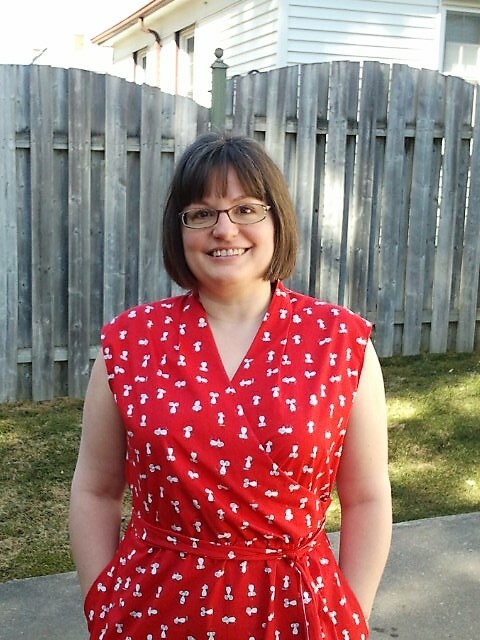 The features that attracted me to this pattern were the mock wrap top (feels much more secure than an actual wrap) and the shoulder/neckline pleat which gives a nice shape to the bodice. I had to adjust the right side of the bodice by just over half an inch where it meets the waist, as my right side is a bit shorter from the shoulder. If you have an issue like this, the bodice will gape — but you can take up the pattern piece either at the shoulder or waist to compensate. I usually adjust at the shoulder, but forgot this time, and had already sewn the facing on…so to save myself time I took a tuck at the waist which is completely invisible. The only other adjustment I had to make was to add pockets. Of course! I used a bit of red broadcloth from my stash and added in side seam pockets. The waist of this dress is lightly elasticized. The view I was using suggested a tie belt that was to be sewn in to the side seams. I didn’t want it to be a permanent part of the dress so I just sewed a regular separate sash; this way I can use it or use another belt for a different look. The key to making a dress like this work with quilting cotton is lots of pressing. Press all the seams as you go, and expect that it will hold the shape a little more crisply than a drapy fabric will. I wouldn’t make a maxi from this fabric as it would be rather bell-like. But in this view it works very well. I just had to get out my own hula hoop and have a little fun. 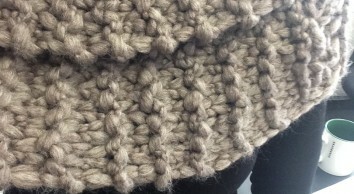 Hi Melanie: Love your sense of whimsy! Thank you for sharing this pretty dress!